Whatsapp Wang @ 93803318 for more details. 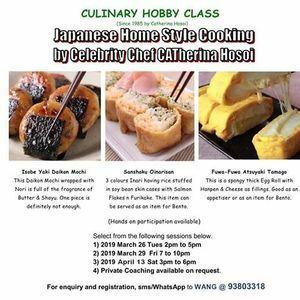 'CULINARY HOBBY CLASS' was started by Food Researcher, Mrs CATherina Hosoi in 1985; specialised in ASIAN COOKING with a wide angle ranging from Japanese, Chinese Dishes & Dim Sum Making, Peranakan & South East Asian Dishes. Select for Hobby/Biz use.